The foundation of its celebration and protection. Among the six hand-picked guests, were three representatives of world’s leading brokerage houses Camper & Nicholsons (France), Northrop & Johnson (USA), and the Luxury Charter Group. Thanks to the growing interest for superyacht bookings in the travel agency world, the group included a representative from influential Australian high-end inbound agency, The Tailor. A journalist contributor to Forbes, Bloomberg and Michelin guides flew in from New York with Tourism Australia’s support, along with the The CEO Magazine’s Editor-in-Chief. “It was wonderful to experience first-hand the latest addition to the Australian charter fleet. ONEWORLD is a beautiful, well-equipped Majesty 100 that delivers a premium charter experience. The Crew and Chef were so professional and the service, the food and the ambience were exceptional. I have a renewed enthusiasm for the Whitsundays and the Reef, thanks to the amazing ONEWORLD charter. 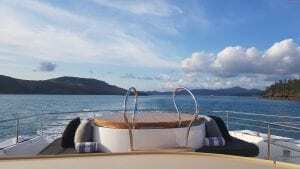 We were able to explore the region’s picturesque islands, from the most remote and untouched bays to the 5-star luxury of qualia and the boutiques, restaurants and attractions of Hamilton Island,” said Jeni Tidmarsh of Luxury Charter Group. The compact trip also included cruising out to the Great Barrier Reef, in a short 3-hour motoring passage, and taking the opportunity to dive on the reef guided by Reef Safari’s insightful Instructor, Brett. “I’ve dived in many places in the world and the clarity on the reef was exceptional at the Stepping Stones dive site. I was so excited to dive in the Great Barrier Reef, and my expectations were way surpassed. I was blown away. 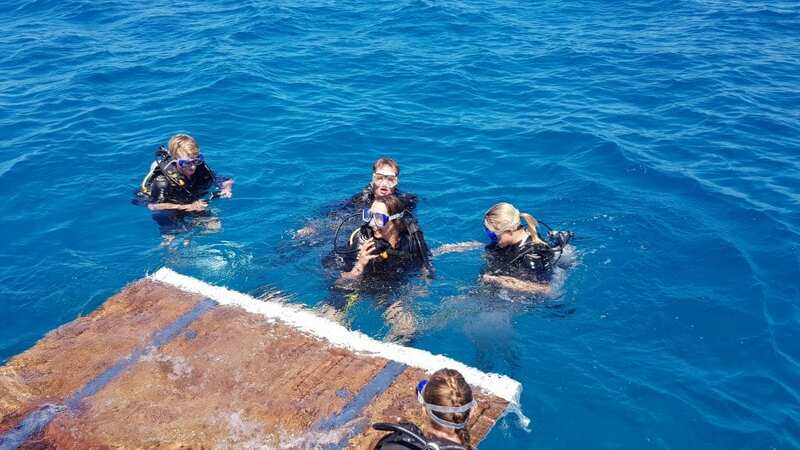 The team at Reef Safari were wonderful guides, pointing out different types of fish and, after our dive, giving a great mini lesson on the fascinating life of reef and coral,” says journalist Sophie Friedman. “I recently read a quote by renowned marine biologist, Sylvia Earle, where she said ‘Please get out into wild places…. And get under the sea. Look at creatures and how they live. It’s hard to be reckless with nature if you have spent time in a wild place. 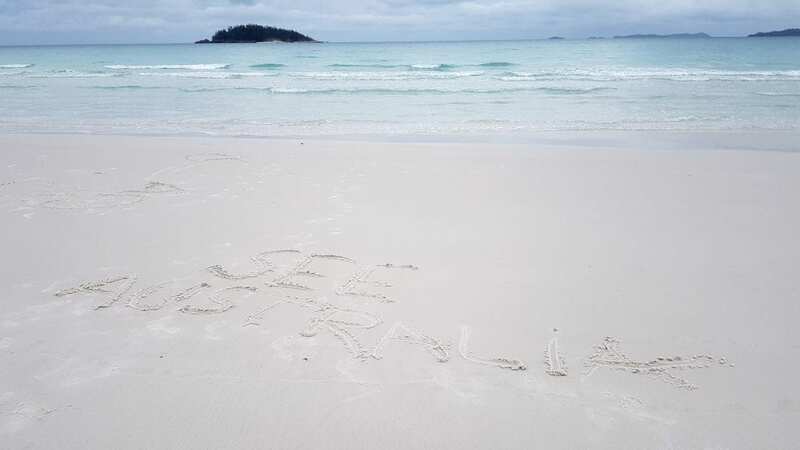 So be a curious explorer!’ and without doubt, we now have six of the most committed ambassadors for the reef and chartering a superyacht in the Whitsunday Islands,” said Laurie Foulon, Charter Experience Manager of Ocean Alliance. Time on Hamilton Island before a short cruise to the night’s anchorage on Whitsunday Island for a three-course welcome dinner. 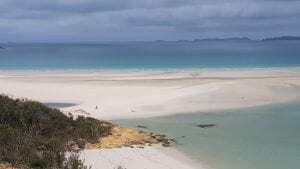 An active day in and around Whitehaven Beach including a swim off the iconic beach plus a seaplane tour over the islands and reef. 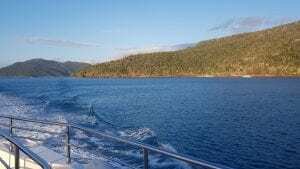 Next, a trek up Hill Inlet before retiring for a BBQ dinner onboard and night time fishing. As you sleep, the yacht cruises out to the reef for a day of snorkelling and diving before returning the protective and tranquil Stonehaven anchorage. After a devilishly delicious breakfast, it is a brisk walk up Passage Peak on Hamilton Island followed by a private tour and lunch at qualia. Then is it time to head back to the mainland and Abell Point Marina. If you are considering your next superyacht charter holiday then contact Ocean Alliance to discuss how a journey onboard ONEWORLD can expand your horizons.